Biography: Faith Fellowship Church Ministries began in 1962 by David's father, who transferred to heaven in 2009. David and Indira now lead two churches and have started 30 churches in their area with the desire to start even more in the future as they continue to preach the gospel in the villages including Hindu villages where the gospel has not been accepted. David tells us, "We have the deepest desire to see the whole Bible taught in all of its glory to the hungry souls of Andhra Pradesh." The focus of the churches are pastoral teaching, youth ministry, widows ministry, and evangelism. 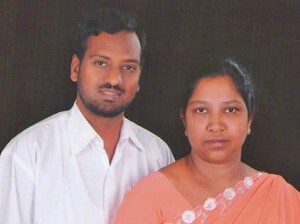 The churches have an active children's ministry with Indira as the children's pastor. The ministry holds conventions, youth meetings, Bible classes and Sunday school services. David and Indira are part of a group of pastors and evangelists who regularly visit hospitals, leprosy homes, and schools to share the gospel of Jesus Christ. Strengths: David and Indira both have pastors hearts with a desire to help those in need.